30 May - 15 September, 15 December - 3 January, 6 February - 24 April. Le Champ du Moulin is in the narrow Vénéon valley at an altitude of 960 m, so the days may be hot but the nights are cool. It is open summer and winter and has 83 level stone and grass pitches, 65 for touring. They are delineated by a variety of trees that offer some shade and all have electricity (6/10A, long leads useful). Rock pegs are essential. When the mountain snow melts in spring, the river beside the site changes from a trickle to an impressive torrent, so parents and dog owners need to be especially vigilant. Large units are accepted but please book ahead. 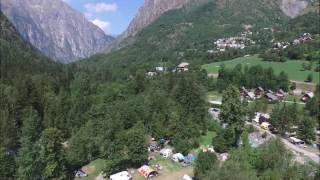 Even though the bustling town of Le Bourg-d’Oisans is only a 15 minute drive away, this peaceful campsite is enjoyed by visitors in both winter and summer. It is a good base for skiing and for exploring this beautiful region. A telecabin near the entrance (high season only) transports visitors to Les 2 Alpes. This renowned resort lies out of sight over a sharp rise and offers miles of ski runs in winter and extensive glacier skiing and mountain hiking in summer. A short walk away is the traditional village of Vénosc. One heated, well equipped sanitary block with washbasins in cabins. Facilities for disabled visitors (key). Laundry and drying room. Motorhome services. Small shop in reception stocks basics. Chalet restaurant/bar with home cooking. Small play area. Sauna. TV room. Boules. Fishing. WiFi (free 5 h/day). From Grenoble bypass Bourg-d’Oisans on the RD1091, signed Briançon. After 3 km. turn right on D530 signed Venosc. In 8 km. pass the telecabin on left. Site on right in 400 m.